This is the second installment of the Utah series. Please visit Part 1 detailing the hike to the top of Angels Landing. 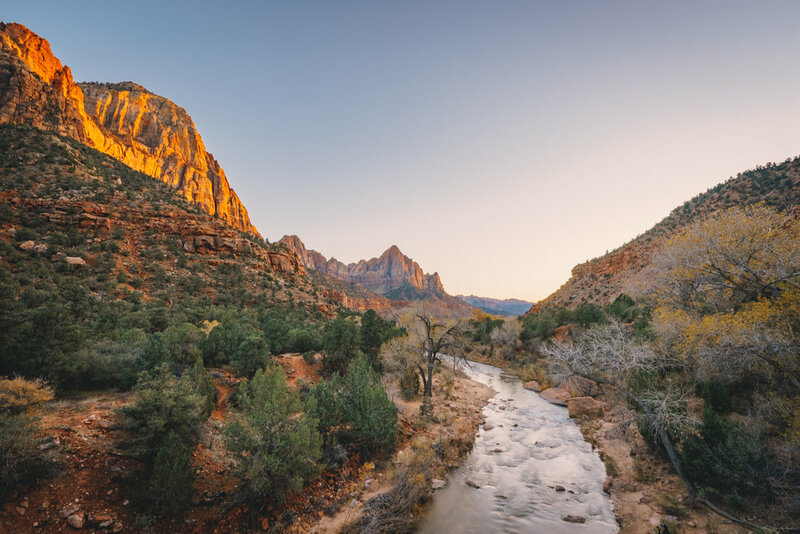 This 4-day journey take us from Las Vegas, Nevada to Salt Lake City, Utah, passing through all 5 of Utah's National Parks along the way. Check the interactive map below for detail itinerary for each day of the trip. Our journey began from Las Vegas where we set off on a 3-hour drive to Zion National Park. The road between Vegas and Zion gave us the peak of the rocky terrain, setting the theme for the trip. First item on the agenda after we reached the park was to watch the sunset at the Watchman. 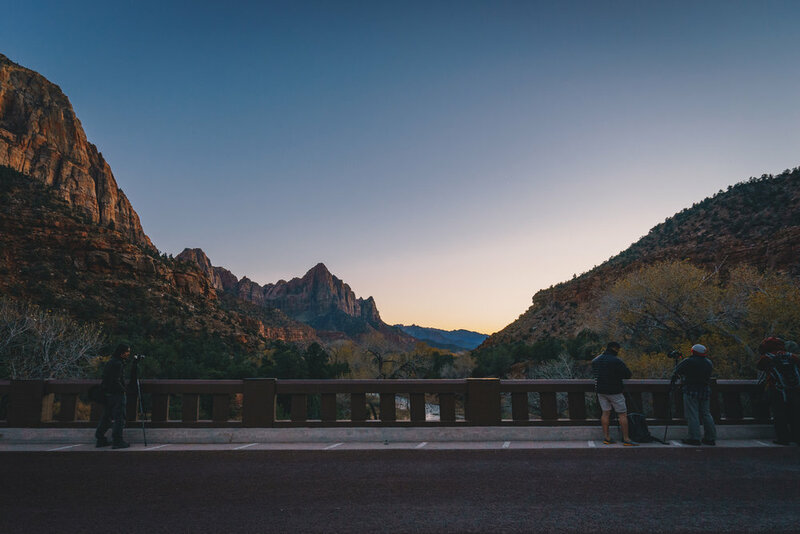 This is a famous spot for sunset photography with the view of the Virgin River as a foreground. The most convenient way to get to this spot is to take the shuttle from the Visitor Center and get off at the Canyon Junction stop. It is recommended that you arrived at least 30 min before the sunset to claim your spot and set up your tripod on the bridge. Click on the photo below for the "behind the scene" look. A view from the top of the Angels Landing. Click on the image for the post detailing breathtaking hike. We spent the night at Springdale, the town right outside of the park. If you come during the holidays, be sure to either make reservation or eat before/after dinner rush as there are only few restaurants around and they get extremely crowded (especially on long weekend). Don't make the same mistake as we did or you would end up having to eat instant noodle from a convenient store of a gas station! We only had one full day at the park so we had to pick the trails to go on. One of the most popular hikes of the park is the Angels Landing. It is a moderately strenuous hike with a breathtaking view. For more detail and photos from the hike, check out my post here. We also did the Riverside Walk, a short hike along the Virgin River. The end of the trail is the entrance to The Narrows which, like its name implies, is the point where the main canyon close in to form a narrow path upstream. Waterproof gears and warm clothings are recommended for this hike as you will be spending most of your time in the river. We were not prepared so we just stop to take photo at the trailhead. Leaving Zion National Park, we headed to Bryce Canyon. As we approach the city of Bryce which is about 9,000 feet above sea level, the temperature dropped below freezing point with the ground covered with snow. After we checked into our hotel and had dinner, we decided to brave the cold and went into the park at night for stargazing at the Sunset Point. The Milky Way is facing away from the canyons in the winter time. We woke up early the next morning to watch the sunrise at, you guessed it, the Sunrise Point. Not able to see anything last night, I was in awe of the first sight of the canyon the moment we reached the outlook. It was quite a sight to see with the sunrise cast an orange shade on one side of the canyon. After breakfast, we headed to the Inspiration Point. Reaching the top of the viewpoint required a hike on an icy trail which reminded me a bit of the time I lived in Minnesota. We got to the top late morning with the sun already out in full force but I think this might even be a better spot to see sunrise than the Sunrise Point itself! We left Bryce Canyon and head further northeast to Moab. This was a 4-hour journey through changing terrains that begins with the drive through the curvy mountain roads, like the ones you'd see in the car review videos on YouTube. I tried hard imagining myself in a drop-top Porsche Boxster as we drove along in our rental Chrysler Pacifica. Along the way was Capital Reef National Park. Its terrain is defined by a 100-mile long landform called the Waterpocket Fold. We stopped to freshen up at the Visitor Center where we saw a big bus with tourists from China. Seeing this was, to me, an indication that United States National Parks are national treasures that people from all over the world are excited to visit. So, don't forget to thank the park rangers that work so very hard to preserve the park and educate the public next time you visit one of these National Parks. Better yet, donate to the National Park Foundation here! Continue driving through straight vast flatlands, we finally reached Moab at night. There, we planned our visits to the last two national parks. We again woke up early to capture the signature Mesa Arch sunrise shot. Seeing it from the photos online, I imagined that this is a huge arch but it turned out that only about 10 people can stand in front of it to get the photo. It was quite gloomy that morning but the sun finally risen above the clouds and we were able to get our shots. Again, click on the photo of the arch for the "behind the scene" look. The photo below was captured from the top of the rock right beside the arch. It is probably my favorite photo of the entire trip. All the canyons and buttes were carved by the Colorado River over millions of years. The morning sun painted a shade of orange over this majestic landscape. It's like seeing the Earth in the prehistoric time. The Arches National Park, as indicated by its name, is full of gravity-defying stone arches and rock formations. We spend a few hours that we have by driving and stopping along part of the 38-mile scenic drive. The most famous arch of the park is the Delicate Arch. Unfortunately, we did not have enough time to do the 3-mile roundtrip hike up to the arch so we viewed it from the Delicate Arch Viewpoint instead. By this time, we were all exhausted by this Amazing Race-esque trip but we still had a snowy, 4-hour drive to Salt Lake City. Our trip concludes with the customary end-of-the-trip bowl of Pho in the city. I would highly recommend anyone who has a 4-day weekend coming up to visit the Utah 'Mighty 5'. For those who have already visited, I am very interested in hearing YOUR story. Please leave your comments down below or contact me via the Contact section of this website.